Endometrin® is a vaginal insert that comes in tablet form. Endometrin® contains progesterone only. It does not contain any Estrogen. Endometrin is sold under various brand names like Estima. Endometrin® contains 100mg of progesterone. At its core, the progesterone hormone is important for the regulation of ovulation and menstruation in women. Endometrin® is used as part of fertility treatment called Assisted Reproductive Technology (ART) treatment. It is for women with low levels of natural progesterone. High progesterone levels are needed for a fertilized egg to implant into the uterus lining and become and embryo. It helps maintain strong uterine lining, helping to see the embryo through the first trimester and avoid early term miscarriage. Basically, progesterone helps women become and stay pregnant. Progesterone causes changes in the lining of the uterus, making it easier for a fertilized egg to attach to the uterus at the beginning of pregnancy. 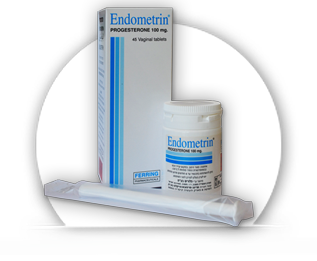 Endometrin® is administered vaginally two or three times a day. The course of treatment is started the day after starting the day after oocyte retrieval. A course of treatment normally lasts around 10 weeks. when using Endometrin® you can experience some unpleasant side effects but most of the time they are nothing to worry about as long as they don’t bother you too much. Side effects of Endometrin® include breast tenderness, constipation, diarrhoea, drowsiness, headaches, nausea, stomach cramps, tiredness, vaginal discomfort and vomiting. These side effects are quite common when undergoing fertility treatment, using birth control or treating menopause symptoms with hormone replacement therapy. Sometimes more serious side effects can occur, in which case you need to contact your doctor right away. If you find any lumps in your breasts, experience chest pain, feel depressed, have a high fever, jaundice, numbness or vaginal bleeding then consider it urgent. It is rare but some women can experience a serious allergic reaction to taking Endometrin®. Symptoms of Endometrin® allergic reaction include difficulty breathing, hives, rashes and swelling of the face, lips or tongue. Please inform your doctor immediately if you experience any of these symptoms of allergic reaction or go straight to the emergency room. Endometrin® contains 100mg progesterone. Do not use Endometrin® if you are allergic or hyper sensitive to progesterone or other ingredients. Remember that Endometrin® is for vaginal use only, do not take Endometrin® orally. If you have had an abnormal pregnancy in the past or have experienced a miscarriage in the past then let your doctor know before you start using Endometrin®. If you suffer from asthma, blood clots, breast or hormonal-related cancer, depression, diabetes, heart disease, high cholesterol or triglycerides, liver disease, migraines, seizures or unusual vaginal bleeding now or in the past then you might not be able to use Endometrin® or you may have to be closely monitored or use and adjusted dose. The information about Endometrin® on this site is purely educational; it does not replace a doctor’s consultation.